Detection and correction. 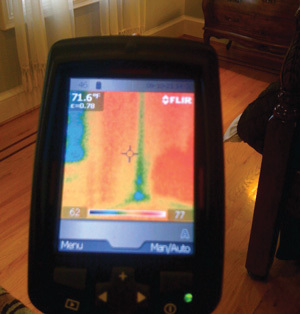 Our experts use an infrared camera (shown above) to reveal air leaks and missing insulation. Global Dwelling suggests that upgrading attic insulation be a top winterization priority. The energy improvement specialists at Global Dwelling can inspect your home and provide you with an estimate that includes the most important improvements that will make the biggest difference in comfort and energy savings. Air sealing and insulation upgrades are often the most important strategies for winterizing your home It’s not easy to pinpoint where warmth is leaking out of your house and where cold outside air is leaking in. That’s why many homeowners decide to have Dr. Energy Saver perform a blower door test and a free energy-saving assessment. Global Dwelling's free insulation inspection will reveal where insulation upgrades can have the biggest impact on comfort and energy efficiency. We can even use special infrared cameras to show you where air leaks and missing insulation are creating cold spots in your house. What energy-saving improvements are right for your house? For an expert assessment of your home’s energy profile, contact Global Dwelling. We provide free estimates for adding attic insulation, air sealing and other home energy improvements in Kingston, New Paltz, Albany and throughout the Albany County area of New York.